Keep impeccable financial records. Yes, it can be chore and certainly not the most exciting aspect of business ownership (to some anyway!). However, being disciplined with tracking and analyzing your financial data will pay off over and over again. Not only will you be better informed while you operate, you will also be able to clearly and concisely validate a selling price and potential profitability to someone else. People make a difference. First, surrounding yourself with great employees will be a key factor in whether or not your business becomes great. A great team to work with also makes business more enjoyable, so investing enough (meaning, a lot!) of your time and energy here will pay off. When the time comes to sell, having a great team to help things carry on might be the most valuable thing you have to offer. Follow the system. One of the most valuable aspects of being in a franchise system is that there are collaboration opportunities, proven resources, and a collective way of doing things. While it sometimes it may be tempting to "go rogue", you greatly risk confusing and possibly even losing a buyer who hears one thing and sees another in how you operate. Follow the system. Be intentional. Obviously about everything, but especially about when is the right time to exit. While sometimes circumstances may dictate this for you, in most cases there just isn't enough thought given to it, and even worse, sometimes not enough effort at the most critical time. Your business is most valuable while it is consistently strong. 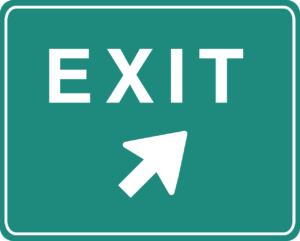 Put your exit strategy thoughts in place as early as possible so that you don't find yourself trying to sell past the point where you are still fully invested and in growth mode. Plan ahead. This sort of summarizes all of the points above, but it is particularly important to give yourself a realistic time frame to remove yourself from the business. Screening potential buyers and negotiating offers simply takes time, and to try pushing that to meet a self-imposed, unrealistic time line is a self-inflicted, unnecessary compromise situation. You control the process when you create the plan. In the beginning, the last thing you often think about is the end. However, we hope these tips help you to understand that you affect the ending with every decision you make in the business from the onset. Since that is a reality, it is far better to be in control of the experience than to be at the mercy of it.